Definition: The Span of Management refers to the number of subordinates who can be managed efficiently by a superior. Simply, the manager having the group of subordinates who report him directly is called as the span of management. 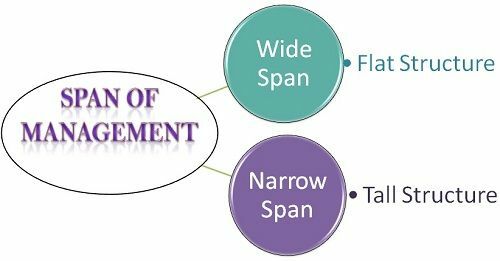 The span of management is related to the horizontal levels of the organization structure. There is a wide and a narrow span of management. With the wider span, there will be less hierarchical levels, and thus, the organizational structure would be flatter. Whereas, with the narrow span, the hierarchical levels increases, hence the organizational structure would be tall. Since the span is narrow, which means less number of subordinates under one superior, requires more managers to be employed in the organization. Thus, it would be very expensive in terms of the salaries to be paid to each senior. With more levels in the hierarchy, the communication suffers drastically. It takes a lot of time to reach the appropriate points, and hence the actions get delayed. Lack of coordination and control because the operating staff is far away from the top management. The major advantage of using this structure is that the cross communication gets facilitated, i.e., operative staff communicating with the top management. Also, the chance of promotion increases with the availability of several job positions. In the case of a flatter organizational structure, where the span is wide leads to a more complex supervisory relationship between the manager and the subordinate. It will be very difficult for a superior to manage a large number of subordinates at a time and also may not listen to all efficiently. However, the benefit of using the wider span of management is that the number of managers gets reduced in the hierarchy, and thus, the expense in terms of remuneration is saved. Also, the subordinates feel relaxed and develop their independent spirits in a free work environment, where the strict supervision is absent.